Uganda and Ethiopia, Africa's leading coffee exporters suffered a decline in shipment in the first four months of the coffee calendar amidst global falling prices. 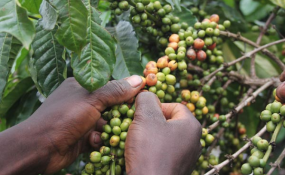 According to latest records from the International Coffee Organisation (ICO), Uganda - the largest exporter in Africa, recorded an 8.8 per cent to 1.47 million bags from October 2018 to January 2019. ICO records further show that Ethiopia - the region's largest producer, and second largest exporter due to significant domestic consumption of coffee, in the first four months of 2018/19, saw its exports decrease by 8.9 per cent to 1 million bags. ICO report indicated: "Growth in exports from Côte d'Ivoire and Tanzania has offset these declines as shipments from Côte d'Ivoire more than doubled in the first four months of 2018/19, amounting to 502,623 bags. While exports from Tanzania increased by 55.7 per cent to 399,540 bags." Despite this performance, coffee production in Africa is projected to improve by 1.8 per cent at 17.8 million bags in 2018/19. ICO report explains that Ethiopia's production is estimated to remain stable at 7.5 million bags, while Uganda's production is estimated to rise 2.2 per cent to 4.9 million bags. Experts in Uganda's coffee industry say if this projection of 4.9 million kilogramme bags is achieved, it will be the highest the country has ever produced. "If we continue that way, we shall not be far from our ambitious production target capacity of 20 million bags at least by 2025," Mr Emmanuel Iyamulemye, executive director Uganda Coffee Development Authority, said. Mr Joseph Nkandu, executive director of Nucafe- (National Union of Coffee Agribusiness and Farm Enterprises) attributes this performance to using new technologies that help the farmer to capture data like such as the Uganda Electronic Single Window (UESW) system. "We now see farmers getting serious on taking coffee as a business by capturing data on their production," Mr Nkandu shared. In February 2019, the ICO composite indicator fell by 0.9 per cent to 100.67 US cents of a dollar, similar to the level in December 2018. The daily composite indicator reversed gains made in January, falling from an average of 103.32 US cents of a dollar in the first week of February to a low of 97.44 US cents of a dollar by the end of February. Prices for Brazilian Naturals and Colombian Milds registered decreases in February, while other milds remained unchanged, and Robusta prices increased 0.5% to 78.65 US cents/lb. Mr Nkandu urged farmers to sell processed and graded coffee to meet the country's targets. "My advice to the farmers to not get discouraged by the current global low prices but instead should plant more coffee so that when the prices increase they will earn more," Nkandu said. Meanwhile, the price of Kenya's coffee at the auction dipped further, shedding 32 per cent of its value since January as international prices remain low. This points to a decline in earnings for farmers this season. A market report from the Nairobi Coffee Exchange (NCE) indicates the price of a 50kilogramme bag has dropped to a low of Kshs13,300 (Shs478,182) from a high of Ksh19,500 (Shs717,273) in January, marking the lowest value to have been realised since the beginning of the year. The price has been dipping in the last couple of sales despite good volumes and high quality beans offered for sale at the auction. The BoU report shows that in the year ending 2018, the country exported a total of 4.1 million (60kg) bags thus fetching the country about $436m (Shs1.5 trillion), up from 4.7m kilogramme bags worth $555m (Shs2 trillion) exported the previous year. Coffee experts attribute the drop in the revenue to the global slump in prices which has been at its lowest since 2006.